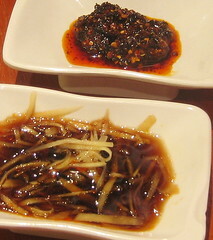 In case u sua gu and dunno how to cook ur order, use ur common sense haha :p~~ Drizzle honey brown sauce and tuck in! One thing though; skip their salmon! Too fishy, bland and tough on the palate! Hence, we opted for our dinner at Asian Kitchen (Citylink's branch). What's more, my disappointment in not being able to get my xiao long bao(soup dumplings) the previous visit at its Marina Square's branch can finally be made up for! There was actually plenty of luncheon meat cubes buried under the rice. Hate the peas though. =p~~ A satisfactory dish that could have been better if it had more wok hei! The Pork & Prawn Dumplings ($4.70 for 4) had generous fillings but would have been better if there was more of that tasty soup in them! The chilli was kinda special; it had a crispy bite and was really fragrant! The ginger slices soaked in vinegar was quite the perfect complement to the Guo Tie! If ur looking for anything else other than fish and chips, u would be sorely disappointed at Fishermen's Wharf. That's right, they only have fish and chips on their menu! However, as though to compensate, they do offer several different kinds of fish. One thing i love about this quaint eatery is that they differentiate between chips and fries. Definitely the chips for me! Fortunately the food made up for it. The batter was crispy and laced with a hint of pepper while its meat was moist and soft~ The chips easily won me over! It's my first time eating my fish and chips the traditional way; with malt vinegar and salt. I thought it would have been awful, given my dislike for vinegar. However, it turned out well as the malt vinegar really brought out the taste of the fish! Sprinkle salt sparingly and tuck in! I still like my tartar sauce though! Fishermen's Wharf's version was good! It's Baby Yi Kang's 1st month celebration! Bought some small pressies for him! And here's the little prince himself! My Tonkatsu set ($15.50)! Was rather cheap considering the generous portions! The breaded deep fried pork was crispy, moist and served with shredded cabbage topped with thousand island dressing~ The sesame sauce dip was quite the perfect complement! The udon was thick, springy and drowned in savoury miso soup. The udon was so thick that i had only 1 strand each mouthful! The soup was so flavourful and there was lots of these fried batter bits~ They turned soggy in no time but it was a pretty nice touch nevertheless! Ended up giving half of my rice and udon to Baby coz i simply couldn't polish off the whole set by myself! Baby's Katsu Curry Don (Regular - $12.80)~ Their menu indicated M and R for their bowl size and i thought M was Medium but it actually turned out to be Mini! -_-"
The curry wasn't spicy at all; instead it was mildly sweet with chunks of carrots in it~ Not a bad version! This was the view we had! ^_^ Should look better at night! In a nutshell, pretty value for money. Prices weren't that high, yet quality wasn't compromised~ The staff's constant loud shoutings of various Jap greetings can get a tad irritating though! I am so dizzy with happiness!!! Look at what Baby gave me!!! Baby knew i was having a hard time collecting these from 7-11 (one doraemon magnet for every $5 spent), so he used a month to secretly collect all these for me! Can't wait to rip them open!!! The soup-of-the-day was cream of chicken. Tasted average; a tad diluted though. The lightly toasted bread was buttered with garlic spread which tasted bland. A single piece of honeydew served as dessert and it was rather tasteless. The only saving grace was the orange juice, which was probably straight out of a carton or something. Baby got their Chicken Superburger (With Egg)~ Hardly deserving of its name. The supposedly Superburger comprised only of a single chicken patty and a fried egg. Did i mention that it's only $5?! Baby complained that the chicken patty was heavily seasoned with pepper too~ When i tried it, i thought that it had this taste that strangely resembled shao xing wine~ O_o"
On our way out of the restuarant, we saw this table of 4 who were pushing the food around their plates before 1 of them blurted out, "Eh ur one nice onot? Mine not nice leh!" There's no service charge and the bill summed up to only $12.80 but we probably wun return any time soon! Being the cheapos good thrifty ppl we are, the $5.90++ porridge buffet at The Rajah Inn's certainly welcoming! Love how the lights illuminating the sign appeared like a heart! There was plenty of watermelon and honeydew available as dessert~ Fresh, juicy and sweet! And u wun go wrong if u order their lime juice ($1.50)! Rajah Inn does not offer buffet for dinner but steamboat instead~ Visit their webbie for more details! Baby and I absolutely do not mind paying good money for food, provided that they come with the expected quality. We get positively pissed at rip-offs! But alas, we were very disappointed indeed! $5.90 for a bowl of kolo mee which tastes like wanton mee is quite ridiculous. What's more, the portion was meagre and hardly filling. Baby then requested for extra noodles for both of us and get this: the extra noodles came at a cost of $2 each! That really took the cake. Might as well not request for the extra noodles coz it hardly made any difference to the paltry portions! Summed up to about $8 for a bowl of kolo mee~ -_-" I say take away the unnecessary items like the boiled wantons and prawns in our soup and shed a few dollars off the price! The noodles. Despite the appearance, it was not springy enough and kind of tasted like the noodles in average wanton mee~ And can u see how dry it was? Bill came up to about $20 (drinks included)~ Rip-off with a capital R! Will not be going back again coz i would much rather go for Parklane or Pontian! We were craving for Arnold's Fried Chicken! Both of us ordered the Half Spring Chicken Set ($4.90 each)~ Am glad to say that they're still as good! The chicken was well-seasoned and fragrant~ Love the cripsy skin and the tender, juicy meat! Here's my previous visit to Arnold's which contains more details! Another satisfying visit to Carl's Jr! Love this place for their burgers and beef chilli cheese fries! Love their free-flow drinks too! I always go for their ice tea where i like to throw in heaps of lemon slices~ Of coz, not forgetting this little creation! In case anyone's interested, click here for their discount coupons which u can print out!